The cost of formula can be challenging for young families, which is why Member's Mark Formula at Sam's Club is a tremendous value at a savings of $500 a year. So that's an easy comparison. More important than price is nutrition. Do a side-by-side formula comparison for yourself. Read the Member's Mark label and the national brand. 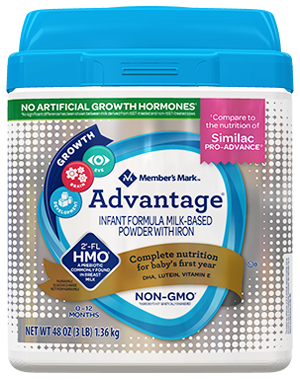 You will learn that our Member's Mark Advantage® Formula has the same ingredients at the same levels as Similac® PRO-ADVANCE® as regulated by the FDA. Member's Mark Advantage has human milk oligosaccharide (HMO), a prebiotic that helps establish beneficial bacteria for immune support. HMOs are oligosaccharides***** commonly found in breast milk. The oligosaccharide 2' -FL HMO is found naturally and abundant in most mothers' breast milk. We added 2' -FL HMO to Advantage so it can help nourish your baby's immune system to be more like the immune system of a breastfed baby. Member's Mark Advantage® is also formulated with prebiotics for your baby's immune system and digestive health. This infant formula also contains the antioxidant Vitamins A, C, E, as well as Zinc for immune support. Our infant formula-manufacturing facilities are located in Vermont and Ohio, U.S.A. Our dairy ingredients are sourced from leading dairy markets, including the United States, Canada, and New Zealand. 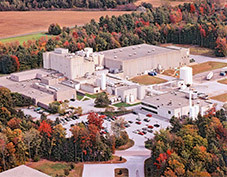 For more than 30 years, the facility has been producing high quality powder infant formulas that meet FDA standards at affordable prices. The facility also meets an array of quality assurance certifications and standards. INGREDIENTS: NONFAT MILK, LACTOSE, PALM OLEIN, WHEY PROTEIN CONCENTRATE, SOY OIL, COCONUT OIL, HIGH OLEIC (SAFFLOWER OR SUNFLOWER) OIL, FRUCTOOLIGOSACCHARIDES (FOS), LESS THAN 1%: CRYPTHECODINIUM COHNII OIL*, MORTIERELLA ALPINA OIL**, 2'-FUCOSYLLACTOSE‡, BETA-CAROTENE, LUTEIN, POTASSIUM BICARBONATE, CALCIUM CARBONATE, ASCORBIC ACID, SOY LECITHIN, MONOGLYCERIDES, CALCIUM CHLORIDE, CALCIUM HYDROXIDE, MAGNESIUM CHLORIDE, FERROUS SULFATE, CHOLINE BITARTRATE, ASCORBYL PALMITATE, SODIUM CITRATE, TAURINE, INOSITOL, ZINC SULFATE, MIXED TOCOPHEROL CONCENTRATE, VITAMIN E (dl-ALPHA TOCOPHERYL ACETATE), NIACINAMIDE, CALCIUM PANTOTHENATE, L-CARNITINE, VITAMIN A PALMITATE, CUPRIC SULFATE, THIAMINE HYDROCHLORIDE, RIBOFLAVIN, PYRIDOXINE HYDROCHLORIDE, FOLIC ACID, MANGANESE SULFATE, VITAMIN K1 (PHYTONADIONE), BIOTIN, SODIUM SELENITE, VITAMIN D3, CYANOCOBALAMIN, POTASSIUM PHOSPHATE, POTASSIUM IODIDE, POTASSIUM HYDROXIDE, NUCLEOTIDES (ADENOSINE-5'-MONOPHOSPHATE, CYTIDINE-5'-MONOPHOSPHATE, DISODIUM GUANOSINE-5'-MONOPHOSPHATE, DISODIUM URIDINE-5'-MONOPHOSPHATE). **Similac PRO-ADVANCE® is a registered trademark of Abbott Laboratories. Member's Mark Advantage® Infant Formula is NOT made by or affiliated with Abbott Laboratories. Store Brand Advantage® Infant Formula does not contain the identical proprietary ingredient blend of prebiotics, patented levels of nucleotides, lutein, and lycopene in Similac PRO-ADVANCE®. ***As used on this website, Non-GMO means the ingredients were not genetically engineered. ****Comparison based on June 2018 price survey of Member's Mark Advantage® Infant Formula vs. Similac PRO-ADVANCE(R). Actual prices may vary by store location and product.